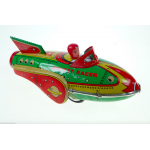 2 Clockwork Tin Toy Astronauts Red and Blue 13cm High ..
CLASSIC SCHYLLING TIN TOY ROCKET SHIPFRICTION MOTOR MAKES CLACK CLACK SOUND WHEN PUSHED APX 19cm Lo.. 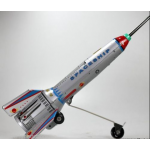 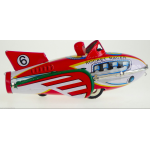 Very Unusual Tin TOy Rocket Ride Apx 20cm With Rocket at top of Trajectory Clockwork..
CLASSIC TIN TOY LARGE SPACE EXPLORER TIN TOY APX 18cm High ..
CLASSIC TIN TOY LARGE SPACE PATROL FRICTION MOTOR WITH CLICK CLAC..
TIN TOY ROCKET RACER Clack Clack Noise from Friction Motor 19cm Long Apx 7cm Width.. 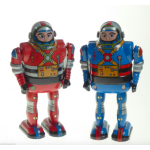 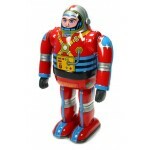 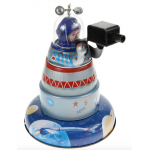 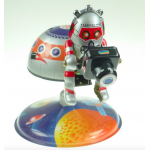 This toy was originally made in Hungary to commemorate the first Russian space flights. 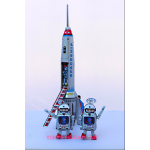 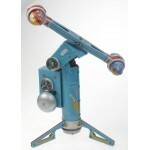 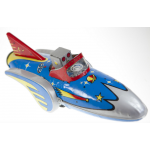 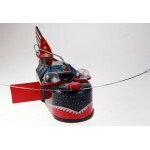 The Hunga..
AN EXCELLENT COLLECTION OF TIN TOYS ONE ROCKET AND 2 SPACEMEN ALL INDIVIDUALLY BOXED A Ret.. 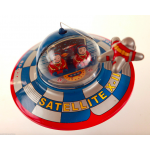 This retro UFO features Mystery Action and an Astronaut performing an EVA - Extra Vehicular Activi..